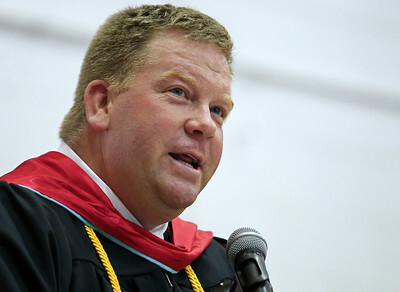 Brett Moist for the Northwest Herald Sarah Baumgart, of Cary Grove, gets emotional when the crowd screams for their children during the Senior Graduation Ceremony at Cary Grove High School on Saturday. Brett Moist for the Northwest Herald Enrique Garcia, of Cary Grove, hugs the Dean of Students, Jim Kelly, to show his appreciation during the Senior Graduation Ceremony at Cary Grove High School on Saturday. Brett Moist for the Northwest Herald Joshua Buckingham, of Cary Grove, looks up at his mom while she is being recognized for her contribution to the school during the Senior Graduation Ceremony at Cary Grove High School on Saturday. 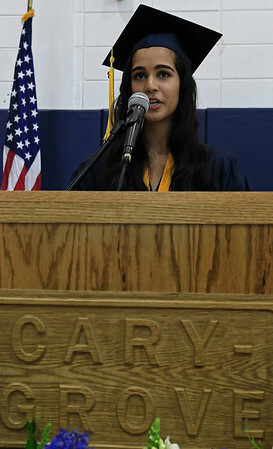 Brett Moist for the Northwest Herald Kreena Patel, of Cary Grove, gives her Valedictorian's address during the Senior Graduation Ceremony at Cary Grove High School on Saturday. Brett Moist for the Northwest Herald Alyssa Cooke, of Cary Grove, stands up to be recognized for being one of the 22% of students with a 4.0 GPA during the Senior Graduation Ceremony at Cary Grove High School on Saturday. Brett Moist for the Northwest Herald Cary Grove graduates sit and listen to speakers during the Senior Graduation Ceremony at Cary Grove High School on Saturday. 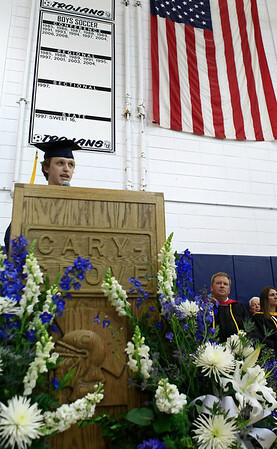 Brett Moist for the Northwest Herald Alex Whitaker, of Cary Grove, gives his Salutatorian's Address during the Senior Graduation Ceremony at Cary Grove High School on Saturday. Brett Moist for the Northwest Herald Janessa Salas (right) helps Jessica Sanchez with her cap before their Senior Graduation Ceremony at Cary Grove High School on Saturday. 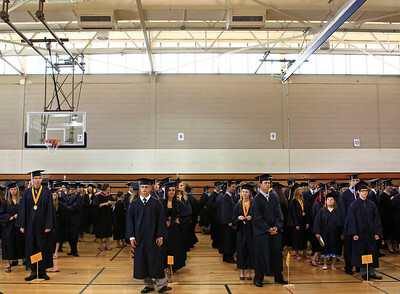 Brett Moist for the Northwest Herald Graduating students line up to get ready for their Senior Graduation Ceremony at Cary Grove High School on Saturday. Brett Moist for the Northwest Herald Nicole Walters, of Cary Grove, give a round of applause for the band performance during the Senior Graduation Ceremony at Cary Grove High School on Saturday. 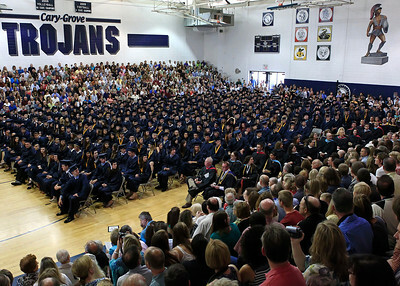 Brett Moist for the Northwest Herald District 155 Board Member Ann Somers hands off diploma Jackets to graduating seniors during the Senior Graduation Ceremony at Cary Grove High School on Saturday. 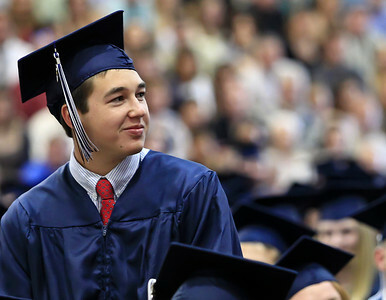 Brett Moist for the Northwest Herald Cary Grove High School Graduate recieved diploma jackets to display their diplomas during the Senior Graduation Ceremony at Cary Grove High School on Saturday. 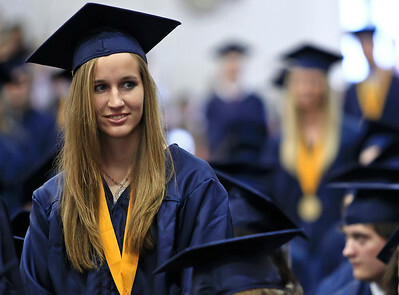 Brett Moist for the Northwest Herald Alexandra Johnson, of Cary Grove, switches her tassle from left to right to signify that she has graduated during the Senior Graduation Ceremony at Cary Grove High School on Saturday. 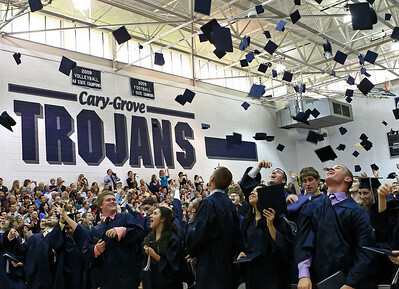 Brett Moist for the Northwest Herald Graduates throw their caps high into the air to celebrate during the Senior Graduation Ceremony at Cary Grove High School on Saturday.